On top of Pluto being demoted, the non-existence of Brontosaurus, and whether it’s okay to proposition a woman on an elevator at 4:00 in the morning we can now add a fun new debate for the online scientific community: is Archeopteryx a Bird or Dinosaur? 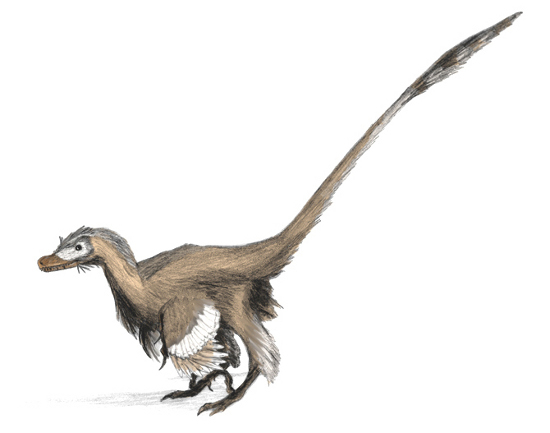 After analysing the traits present in Xiaotingia and its relations, Xu and his colleagues are suggesting that the creatures bear more resemblance to the dinosaurs Velociraptor and Microraptor than to early birds, and so belong in the dinosaur group Deinonychosauria rather than in the bird group, Avialae. 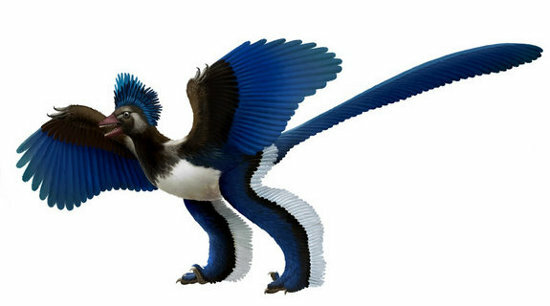 Many features led the team to this decision, but the most immediately noticeable are that Xiaotingia, Archaeopteryx and Anchiornis have shallow snouts and expanded regions behind their eye sockets. Microraptor has similar traits, but the early birds in Avialae have very different skulls. To summarize: Back when Archeopteryx was the only fossil we had that possessed both dinosaur and bird traits, it made sense to consider it the “link” between dinosaurs and birds. 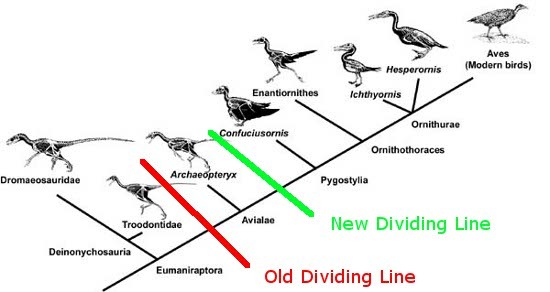 Now that we have lots of other bird-dinosaur hybrid fossils from this same period in evolutionary history, we no longer know which of them, if any, is a direct ancestor of modern birds. 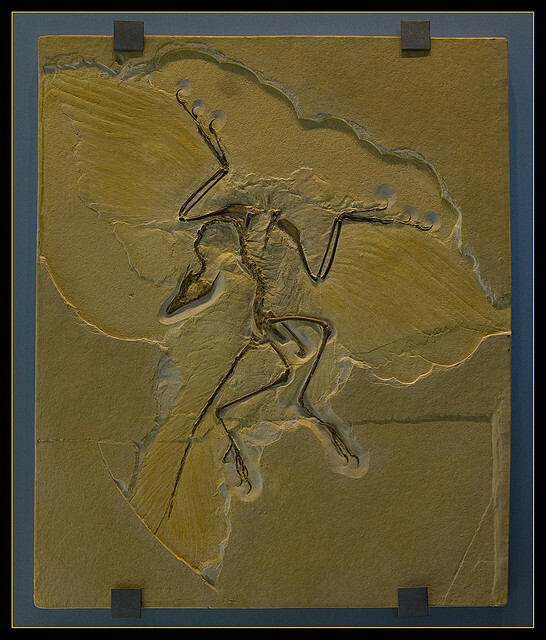 Therefore, it is no longer accurate to call Archeopteryx the first bird, because there are so many other contenders in the mix now. One of the reasons for its success is that science has built-in, error-correcting machinery at its very heart. Some may consider this an overbroad characterization, but to me every time we exercise self-criticism, every time we test our ideas against the outside world, we are doing science. When we are self-indulgent and uncritical, when we confuse hopes and facts, we slide into pseudoscience and superstition. Every time a scientific paper presents a bit of data, it’s accompanied by an error bar – a quiet but insistent reminder that no knowledge is complete or perfect. It’s a calibration of how much we trust what we think we know. If the error bars are small, the accuracy of our empirical knowledge is high; if the error bars are large, then so is the uncertainty in our knowledge. Except in pure mathematics nothing is known for certain (although much is certainly false). But this isn’t the end of the debate. This is just one research paper. This is a tough question that grows tougher all the time as our library of fossils grows and what were once clear transitions between species along the tree of life get smoothed out into slow, gradual changes, just as evolutionary theory predicts. When we have enough fossils to illustrate a clear, smooth transition from one species to another, where do we draw the line between the two? As Richard Dawkins puts it , what individual gets to be the first representative of their species? As we trace the ancestry of modern Homo sapiens backwards, there must come a time when the difference from living people is sufficiently great to deserve a different specific name, say Homo ergaster. Yet, every step of the way, individuals were presumably sufficiently similar to their parents and their children to be placed in the same species. Now we go back further, tracing the ancestry of Homo ergaster, and there must come a time when we reach individuals who are sufficiently different from ‘mainstream’ ergaster to deserve a different specific name, say Homo habilis. And now we come to the point of this argument. As we go back further still, at some point we must start to hit individuals sufficiently different from modern Homo sapiens to deserve a different genus name: say Australopithecus. The trouble is, ‘sufficiently different from modern Homo sapiens’ is another matter entirely from ‘sufficiently different from the earliest Homo’, here designated Homo habilis. Think about the first specimen of Homo habilis to be born. Her parents were Australopithecus. She belonged to a different genus from her parents? That’s just dopey! Yes it certainly is. But it is not reality that’s at fault, it’s our human insistence on shoving everything into a named category. In reality, there was no such creature as the first specimen of Homo habilis. There was no first specimen of any species or any genus or any order or any class or any phylum. Every creature that has ever been born would have been classified – had there been a zoologist around to do the classifying – as belonging to exactly the same species as its parents and its children. Yet, with the hindsight of modernity, and with the benefit – yes, in this one paradoxical sense benefit – of the fact that most of the links are missing, classification into distinct species, genera, families, orders, classes and phyla becomes possible. Missing links make classifying species taxonomically possible. So congratulations to Confuciusornithidae (“holy Confucius bird”) on becoming the first bird!–At least in some scientists’ minds… until we have more fossils and more debate to work this out. Of course, this whole Bird Versus Dinosaur debate ignores a larger debate in the realm of taxonomy, whether reptiles belong in the field of Herpetology, with amphibians like frogs and salamanders, or Ornithology, with birds. Richard Dawkins goes so far as to argue that the whole class Reptilia is silly for having some species that are more closely related to amphibians, but others more closely related to birds and yet birds are really just another branch of reptiles. A great site overviewing the links between dinosaurs and birds. Maybe when it is time to move from Homo sapiens to our next species, we can have a big reality show to determine who is the honorary first specimen.